Many people are traveling from the various city-states of Greece to deliver their gifts to the almighty Zeus in hopes of his blessings. His tastes are quite peculiar, but these goods can be obtained by anyone willing to seek them out. Word on the street is that Zeus can be easily pleased with the right gifts, and he is very generous with his rewards. In a conversation with [Event]Zeus' Loyal Believer in Sparta or Athens, players can receive hints on what gifts Zeus currently desires. The right gifts will earn players Zeus' blessings, in the form of rewards. Players can make up to ten deliveries each weekday, and up to twelve deliveries on Saturday and Sunday. 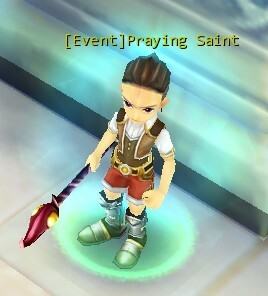 During each time, players will receive a Praying stone, EXP, and talent points. The more gifts that are delivered, the better the rewards. There is a possibility that Zeus may even share some of his treasured wine with you for your devotion and generosity. This mission runs on a series of 10 quests, and as you advance the quest line will become more challenging. There will be times that you don't want to spend more time tracking down some of the gifts, and 10 Level 1 Crystal will be very useful in these instances. 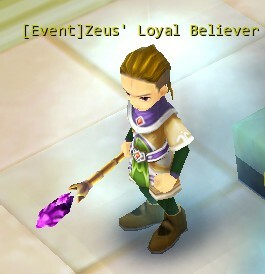 10 Level 1 Crystal can be used as a substitute for any of the gifts that are intended for Zeus. Without the gift or the Crystals, your only option will be to restart the mission. Unfortunately, when you do this, your reward from Zeus will be downgraded. The Praying Stones are worth mentioning because they can be deposited. The more you deposit, the better chance you have of receiving great rewards with your dust materials (including Strength Dust, Shield Dust, Magic Dust, Spell Dust, Absorption Dust, Health Dust, Mana Dust, Blood Dust, and Vigor Dust). The Praying Stones can be deposited from Monday at 12am to Friday at 11:55pm. All players will have five chances to trade in their dust materials for rewards from Saturday at 12pm to Sunday at 11:55pm; it is even open those who have not deposit their Praying Stones, but depositing them will increase your chances. Keep in mind that there is a chance for any of the transactions to fail, and the more valuable the reward is that you are pursuing, the greater the chance of failure. Two types of rewards will be distributed over the weekend. One type is the ordinary item, which will be nontransferable, and the other type is limited, which are on a first-come first-serve basis. The ordinary items consist of Level 1 Crystal, Quest Scroll, Level 2 Crystal, Mystic Spell, and suits of a 7 day lifespan. Limited items include Quartz Plate 3, Level 3 Crystal, Parcel Stone, Flame Spark, Quartz Plate 2, Mystic Spell, and Amethyst. The limited items are in short supply and are nontransferable, so you'd better act fast as they will be in high demand! From 12:00pm, every Saturday, you get to try your luck with Zeus. You will get a score randomly with every 10 Dusts you turn in. And all scores will be compared at 12:00pm, every Sunday, Whoever gets the highest score in the whole faction will win a prize! Surprises should be expected if you hit a lucky number (determined randomly)! Submission of 1 Praying Stone will grant you one more chance to try your lucky. Good luck, have fun, and behave out there. Zeus is watching.